Add this 4th Rotary Axis and mill 360° 3D parts. Highest quality, high-precision worm-gear with a stopping moment of over 20Nm. Because of its exisitng 7mm drill-hole, the rotation table can be clamped horizontally as well as vertically, providing great flexibility in setup. 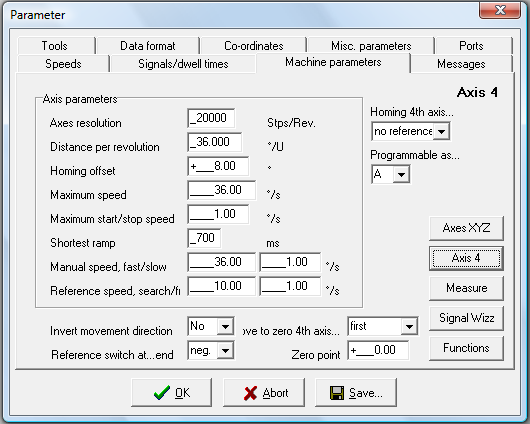 These are the WinPC-NC settings for the Zero3 controller with 4th axis setup. Copy this file to your Vectric PostP folder, it replaces Y axis moves with A-axis (rotary) moves. To install, go to your VCarve Pro or Aspire File menu and select the option 'Open Application Data Folder ...'. This will open up the program's data folder. Then navigate to the 'PostP' folder and copy the file there. Now when you open the post processor drop down, you'll see the new post processor available. Copy this file to your Vectric PostP folder, it replaces X axis moves with A-axis (rotary) moves. To install, go to your VCarve Pro or Aspire File menu and select the option 'Open Application Data Folder ...'. This will open up the program's data folder. Then navigate to the 'PostP' folder and copy the file there. Now when you open the post processor drop down, you'll see the new post processor available. Also available as an option with our 4th rotary axis is a ring engraving accessory. Engrave on the inside or outside of the ring. Can the 4th axis be used to turn a part bu 180 degrees for double-sided milling? For example turn a piece over and then use a pocket or v carve toolpath? If so do you have a video of this being done? Yes, the 4th axis uses a worm-screw, so it can move continually in either direction - there is no limit on the number of rotations. So it can support indexed milling as well as full rotary milling.